There are those days when the sight of your stove top can make you cringe. Then there are the days when you spend a couple of minutes with your head in the freezer and then reach for the delivery menus. Especially during the holidays. If you’re worn out from Christmas shopping and the idea of mediocre Chinese doesn’t sound that appealing, well…. 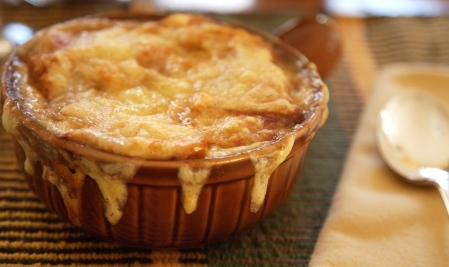 there is an easy and elegant life solution: Soupe a l’oignon gratinee. The soup that had its origins in Les Halles in Paris has been much imitated, sometimes with less than successful results. It is said to be a good preventive for a hangover and makes a great breakfast. Assuming that you breakfast in advance of returning home from the evening. And as winter descends, it is a comforting, warm and nourishing meal that is very easy to prepare at a moment’s notice. Especially since it uses stale bread. Here, then, is my own recipe, which has never failed to pick me up. About 1 oz of olive oil or other oil. 2 Broiler friendly bowls. I have some 70’s era brown bowls with handles like the one in the photo above. Last night I used a plain white bowl from Crate and Barrel that was oven-safe and a bit deeper. Melt the butter in a deep skillet and add the oil when it starts foaming. Add the sliced onion, pepper and herbes de provence. Cook, stirring occasionally, over medium heat until the onions are wilted and starting to carmelize. Sprinkle with the flour, cook, stirring for about a minute. Pour in some of the chicken bullion or the wine and scrap up any bits that have stuck to the bottom of the pan. You’re basically making a sort of roux. Add the rest of the chicken and beef bullion. Set to simmer while you prepare the bowls. Break the clove of garlic with the heel of your hand and rub the crusts of bread and the insides of your bowl with the halves. Drop the bread into the bowls. Discard the garlic. Broil until the cheese is brown and bubbly. Serve with a green salad and a bottle of light red wine like a Beaujolais or Côte du Rhône. Or a Pinot Blanc or California Chardonnay if you prefer white. This entry was posted in Entertaining, Living and tagged cooking, dinner, Entertaining, french food, Living. Bookmark the permalink. Oh, this is my favorite soup! Every time I see it on the menu. I order it, although I have always suspected that it would be something that I could make at home (as an experienced cook). Too bad it is 77 degrees plus here in Atlanta this week (record setting temperatures for the week), as this is a dish that would be better suited to cooler temperatures outside. P.S. – Lovely blog! I am going to link to you. TTI– The night I made the soup last week, it snowed here in Richmond. Today we’re expected to hit 80ºF! I can relate. And thanks for the compliments and link. I have enjoyed your blog as well. Great content. Yum!!! My favorite soup! Thanks for the wonderful recipe. I love this soup and particularly for breakfast, it means I has a very long interesting night. Oh, this looks soooo good. I just had a great bowl at Pastis in New York last week. It was even better with the snow falling outside! Thanks for posting this recipe. A pleasure. Please enjoy! Pastis, I’m jealous. Mrs. E. and I won’t make it to The City until our pilgrimage to see “Making it New” at Yale. Hate to miss New York at the Holidays!